Through its Stratified Medicine Programmes (1 & 2), Cancer Research UK (CRUK) is taking ambitious and significant steps towards making targeted therapies available to cancer patients in the UK. Working together with the ECMC Network, feeder hospitals and molecular genetics laboratories across the NHS, we have established the foundations for a national molecular diagnostics service that offers high quality, standardised and cost-effective genetic testing to patients within a clinically useful timeframe. A genetic test can help doctors to decide on the most suitable targeted treatment for an individual patient. Furthermore, through demonstrating the feasibility of routinely collecting and testing tumour samples as well as collecting clinical data, we have built a national database of information relating to tumour genetics, cancer treatments and patient outcomes that will act as a valuable resource for researchers in the future. Stratified Medicine Programme 1 (SMP1) ran from July 2011 to July 2013 and was a collaborative programme between; Cancer Research UK, NHS, ECMCs, Department of Health, Astra Zeneca and Pfizer (pharmaceutical partners), Illumina (technology provider) and Innovate UK. This was a pilot study to demonstrate on a small scale how the NHS could routinely provide molecular diagnosis for patients with solid tumour types. Doctors in eight ECMCs (known as Clinical Hubs, that included Birmingham, Cambridge, Cardiff, Edinburgh, Glasgow, Leeds, Manchester and The Royal Marsden), consented >10,000 cancer patients across six indications; breast, ovarian, lung, colorectal, prostate, melanoma. Patients receiving their cancer care at these hospitals were asked for permission to use surplus tumour tissue taken during routine surgery. Surplus samples were sent to one of three centralised, quality assured laboratories (known as Technology Hubs and included Birmingham, Cardiff and The Royal Marsden) where DNA was extracted, stored and tested for a set of specific genetic variations known to be associated with their cancer type. The genetic data and relevant clinical information was stored within a central data repository at the National Cancer Registration Service (NCRS), Eastern Offices. Collecting and storing information about patients’ tumours and related clinical data is part of the Cancer Registries remit and they have been granted authority to do this by law. Cancer registries use this information to help understand the causes of cancer, compare the success of different treatments and to drive progress in research. SMP1 data is now available for use by researchers involved in the study. Please contact Hanna.McEvoy@cancer.org.uk for further information. 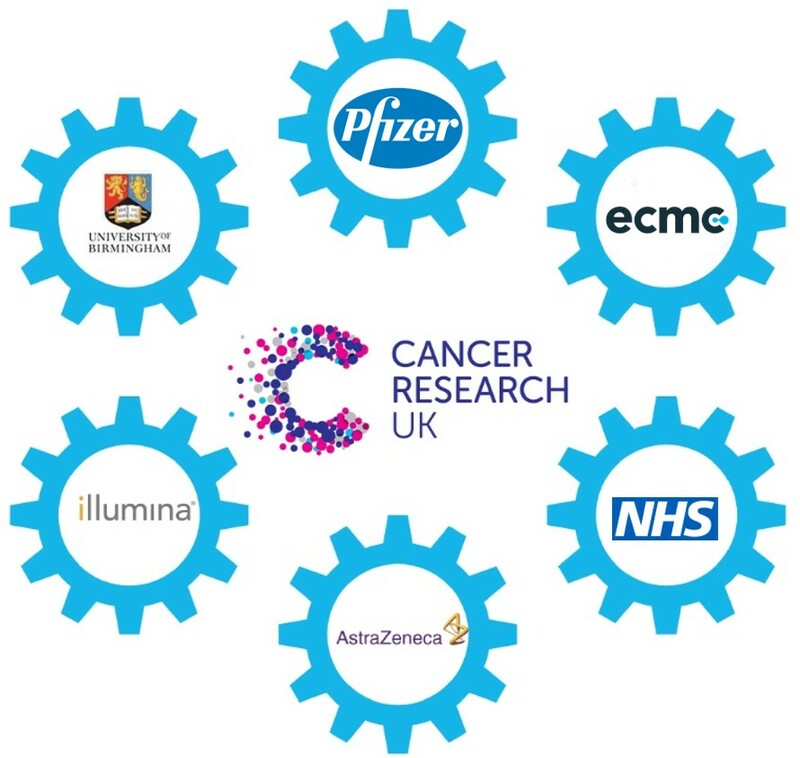 Cancer Research UK, NHS, ECMCs, University of Birmingham Cancer Research Clinical Trials Unit (CRCTU), Illumina (NGS technology provider), Astra Zeneca and Pfizer (pharmaceutical partners) and builds on the foundation laid in SMP1. Collaborative partners work as a consortium, enabling eligible patients the access to novel, targeted lung cancer therapy. SMP2 aims to incorporate all eighteen ECMCs, as well as selected feeder hospitals across the UK, into a pre-screening network. These hospitals consent patients for the programme and subsequently send tumour samples (excess tissue taken from routine diagnostic biopsy) for genetic testing at one of three Technology Hubs. Our Technology Hubs (at Birmingham, Cardiff and The Royal Marsden) use innovative Next Generation Sequencing (NGS) technology to detect a variety of changes in the patient’s tumour DNA sequence. The NGS panel was developed by Illumina in close collaboration with Cancer Research UK and the Technology Hubs, and can be updated regularly to reflect the needs of the programme. Genetic results are released to the referring Clinical Hub in a clinically relevant timeframe. 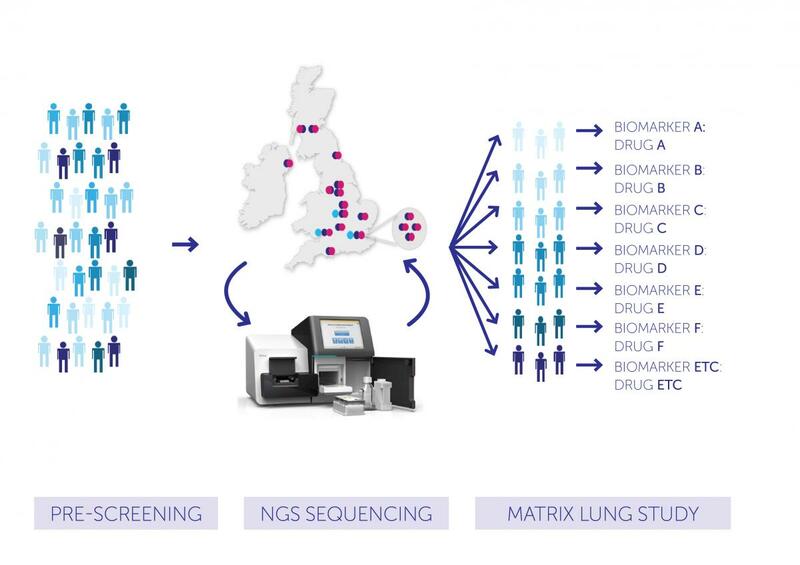 The National Lung Matrix Trial (NLMT) is coordinated by the Birmingham Cancer Research UK Clinical Trials Unit (CRCTU), with Professor Gary Middleton leading as Chief Investigator. The trial recruits patients with stage IV disease, or stage III disease not amenable to surgery or radical radiotherapy, and allocates them to a treatment arm according to their molecular phenotype as determined by the SMP2 pre-screening programme. NLMT is a multi-arm multi-stage trial currently recruiting to 8 clinical arms.